At The Heritage Law Group in San Jose, California, we are fully committed to delivering the exceptional legal counsel and support you deserve to help you find solutions for your important and sensitive legal challenges efficiently and effectively. Serving a diverse range of clients throughout Santa Clara County and the surrounding areas for more than 20 years, our law firm has become the trusted source of quality representation to the residents and businesses of our community, and our attorneys possess over 30 years of combined experience in a variety of legal areas. Over the years, we have established a reputation for our personable approach to litigation and establishing and maintaining a good rapport with opposing counsel. This approach has helped us consistently achieve our primary goal, which is to help our clients resolve their conflicts and find solutions to their disputes as efficiently as possible, and we have achieved a 98 percent success rate of settling cases before they go to trial. However, our good-natured demeanor does not belie our ability to aggressively pursue the most favorable outcome on your behalf even if that involves litigation, and we promise to always keep you rights and best interests at the forefront of our efforts while remaining accessible at all times to address your questions and concerns as they arise. 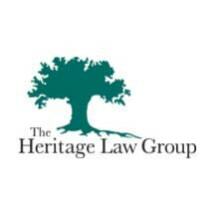 To find out more about how The Heritage Law Group can best serve your needs, you can contact our law office to schedule an appointment for a consultation.